I just discovered Lucrezia Bieler's sublime work through Paper Forest. 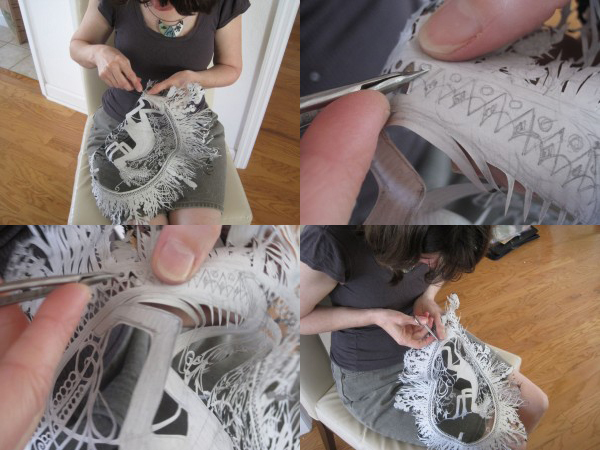 Her papercuts truly are works of art and an awesome showcase of imagination and technical knowledge that comes together to create pure magic. I aspire to be that good one day. I especially love how a detailed shape emerges in gestalt from the black void in the two pieces featured here. Lucrezia prefers the scissors (teeny tiny scissors!) to the scalpel knife), and she fearlessly snips and twists and drapes her paper until all her cuts have been made and the image emerged. I'm awestruck. When I feel that catch in the back of my throat like I want to weep is when I know I'm done for. Hello new obsession, I'm going to fangirl all over you! Paper Forest | New papercutting exhibition opening in LA tonight! WOW!!!! Such beautiful detailing and wonderful subject matters. Thank you for following! Your artwork is amazing! And I think your branding for Carmen Moreno is a touch of genius! I'm currently trying to work mine out, which is how I found your work on pinterest.